When it comes to biodiversity, Peru sits in the top 10 countries in the world. And it boasts 28 of the world’s 32 climate zones. Therefore, finding a good location to live with an agreeable climate should be fairly easy. Add the fact that it is one of the most affordable places to retire and it is surprising that more visitors haven’t decided to stay long-term. A couple can live comfortably on less than $1,800 per month in most locations. 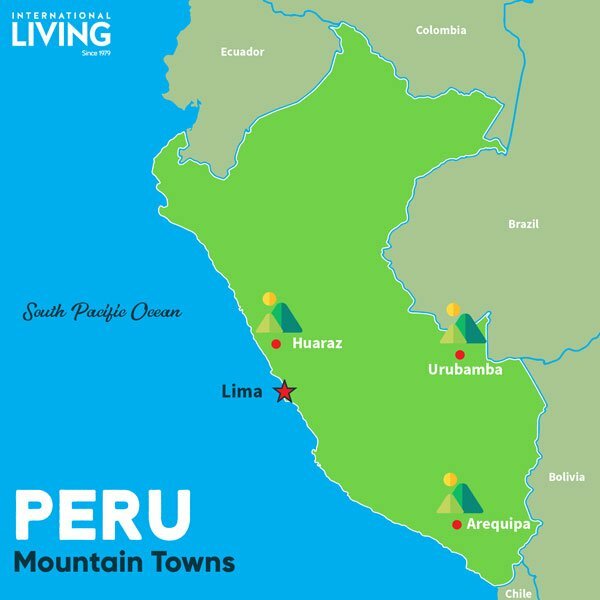 Two or three-bedroom furnished rentals are available for less than $600 per month in many areas outside Lima. The easiest way to find accommodation is to hit the pavement and look for real estate signs or pick up copies of the more popular local newspapers and browse the classifieds. From sprawling desert to towering mountain peaks to the Amazon jungle, Peru is a goldmine for outdoor enthusiasts. The 1,500-mile coastline stretching from Ecuador to Chile offers some of the best surfing in South America to eager participants. But aside from Machu Picchu, much of the country remains unfamiliar to outsiders. 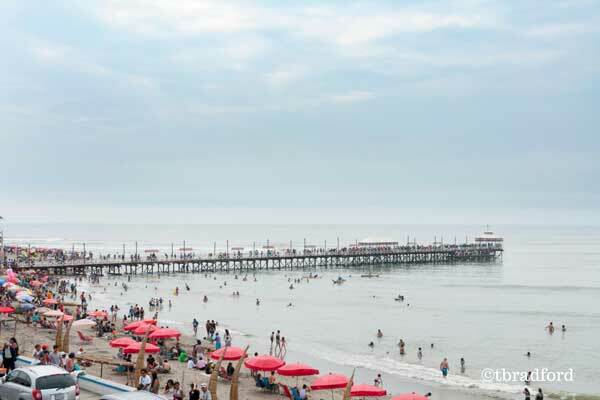 Here is a quick look at some of the best beach and mountain towns in Peru. Punta Sal: The Best Beach in Peru? Thanks to the cool Humboldt Current, the southern half of Peru’s coast is covered in cloud for much of the year. However, as you head farther north, blue skies and warm weather tend to be the year-round norm. Punta Sal is considered the nicest beach in the country. It offers a four-mile expanse of white powder sand beaches and a daily average temperature hovering in the low 80s. Even the ocean stays a constant 75 F year-round. This small village of 5,000 is the place to live if you are looking for a laid-back beach life with calm water and copious amounts of sunshine. The bustling city of Tumbes and the Ecuador border is only 50 miles north. If you get bored with the peace and quiet, you can always take a 20-minute drive south to the busier and noisier tourist resort town of Mancora. Real estate can be difficult to find in this area but a large four-bedroom home on the beach was recently listed at $290,000. Expats living here tend to operate B&Bs or other tourist related businesses. A modern two-bedroom condominium on nearby Zorritos beach can be purchased for $140,000. There are currently several new large condominium projects planned for development along the coast. There are several small towns along this part of the coast stretching all the way to the small coastal village of Organos. The beaches are beautiful, and the weather is great but don’t expect any big city lights. These are places people come to get away from it all. Outdoor lovers will enjoy exploring nearby Amotape Hills National Park and the Tumbes National Mangroves Sanctuary where a wide variety of flora, fauna, and birds can be viewed. 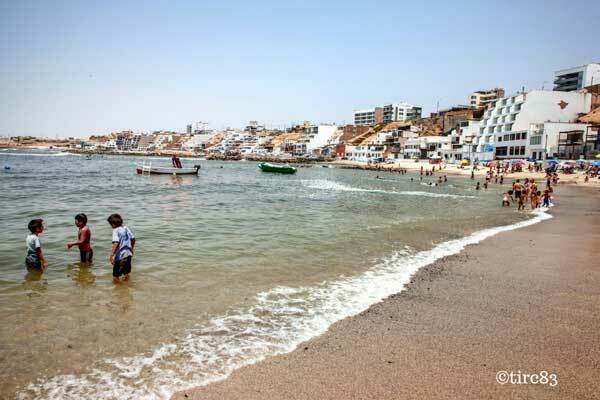 Head 400 miles farther south and you arrive at the small fishing village of Huanchaco. The sand is no longer white powder and the weather is cooler, but the village has a comfortable vibe. As on all Peru beaches, you are more likely to find pelicans than seagulls hanging out along the shoreline. Huanchaco is best known for the hand-crafted reed boats that fishermen first started using over 2,000 years ago. Ceviche, fresh raw fish cured in citrus juices and spiced with chili peppers, is a popular dish in the area and found in almost every restaurant lining the main road along the beachfront. Throughout the year a good variety of waves attract surfers of all ages to try their luck. On any given day, wannabe surfers and experienced professionals can be seen all over town carrying colorful short and long boards. Up until recently, many people here didn’t even lock their doors. Children still play on the streets and residents walk down the middle of the roads. Restaurants, street vendors, and hostels line the main beachfront road but that is about the only busy part of town. It’s also where you will find most local and international tourists. Stroll back a couple of blocks from the water and it is a peaceful small Peruvian community. We rent our new furnished three-bedroom, two-bathroom apartment for $600 per month, including Internet and all utilities but older unfurnished units are available for much less around town. The beach is only a five-minute walk from our front door and all amenities are within a short walk. In Huanchaco, a couple could easily live on a budget of $1,500 or less. The historic city of Trujillo with its one million residents and modern amenities is only 20 minutes away. Beautiful wide expanses of empty beach can be found in both directions along the coastline only minutes from Huanchaco. 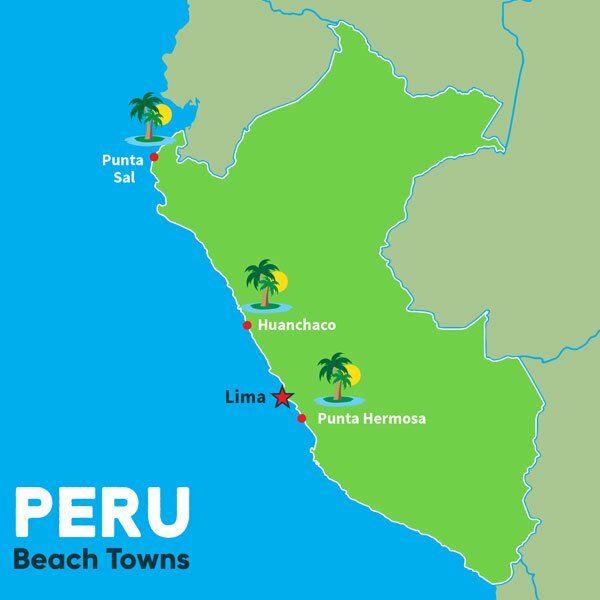 Parts of Lima overlook the Pacific beaches below but drive another 40 minutes south and you will arrive at the smaller beachside resort town of Punta Hermosa. 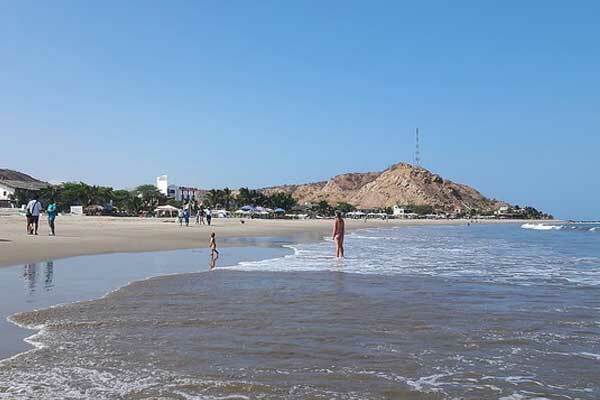 Here the beaches are known as “los 4 kilometros de oro” (the four kilometers of gold). Along the coast, there are 12 breakers that are among the best and most varied waves in Peru. Once a summer resort town for Lima residents, Punta Hermosa has now become more of a year-round place to live. This increase in permanent residents has brought an influx of shops, restaurants, and other amenities. It is also one of the cleanest sections of water in the Lima area because there is no drainage directly into the ocean. Recycled water is used for irrigation. Prices start at about $150,000 for a new three-bedroom condo with a sea view. With Lima only 40 minutes north, there is easy access to all the city has to offer in terms of nightlife, culture, and cuisine when the need strikes. And the Jorge Chavez International Airport is only about 30 miles away. Most of Peru’s mountain towns and cities are located at quite high altitude and Huaraz is no exception. Sitting at over 10,000 feet, it is known as the “Switzerland of Peru.” As the gateway to the Cordillera Blanca, a 124-mile mountain range in the Andes, the town is surrounded by snow-capped mountains reaching skyward to heights over 22,000 feet. Its tropical mountain climate has cool nights with daytime temperatures reaching the low 70s. It is a long way from any beach, but this city of 130,000 is popular for its nearby mountain activities. Day hikes, trekking, rock climbing, and mountain biking are only a few of the outdoors adventures available. From turquoise lagoons to 3,000-year-old archaeological ruins, there is a lot to explore in this area. Because of the large number of annual tourists, there is a substantial expat population in the town. A three-bedroom apartment near the center of town can be purchased for less than $100,000. Huaraz also has a good selection of bars and restaurants to keep you entertained. There is even an English newspaper, The Huaraz Telegraph, that provides news, views, and tourist information about the city. Stretching over 60 miles from Machu Picchu to Pisac, the Sacred Valley of the Incas is visited by over 1 million tourists per year. Less than a mile wide and bordered by jagged mountains, it is an incredibly beautiful part of the country. The mountain top citadel of Machu Picchu is the main attraction, but the valley is also home to a large number of other spectacular Inca ruins. The climate is defined by warm days and cool nights for most of the year. 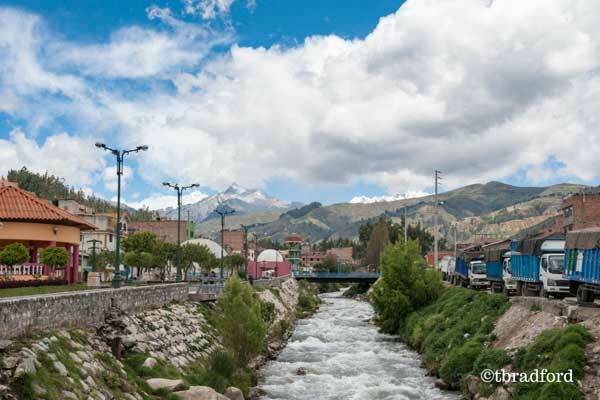 Only an hour from Cusco, Urubamba is the largest town in the Sacred Valley. It takes its name from the picturesque Urubamba River that peacefully flows the length of the valley. With an elevation of 9,400 feet, the town is almost 1,000 feet lower than nearby Cusco. There are plenty of Inca ruins to explore nearby and lots of hiking trails to keep you busy. One of Peru’s most renowned ceramic artists, Pablo Seminario, has a large workshop here where ancient designs and contemporary techniques are combined to produce both decorative and functional pieces in a wide variety of styles and sizes. They also provide regular classes to anyone interested. Spacious homes to rent can be found both in the town itself and out in the countryside for less than $500 per month. Great deals on both rentals and properties for sale can be found by chatting with local residents and checking out the bulletin boards around town. A large variety of fresh fruits and vegetables are available for rock-bottom prices at the large daily farmers’ market located in the center of town. Residents from nearby towns in the valley come to Urubamba to shop. Inexpensive buses leave regularly from the town center to points around the valley. 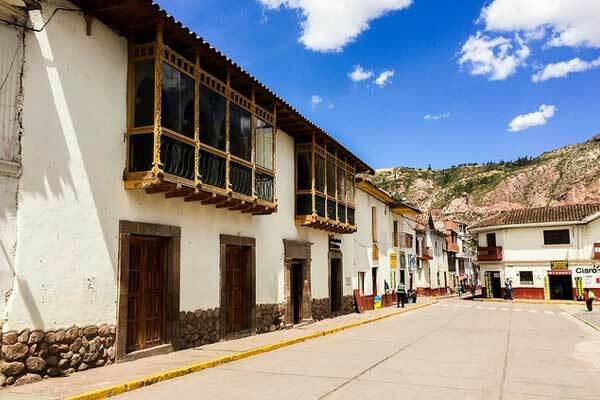 Urubamba competes with nearby but smaller Pisac as “the best town in the valley to live”. Although not technically a “mountain town”, Arequipa is located at an elevation of almost 8,000 feet. And a series of volcanic cones dominate the city skyline: Misti, and the extinct volcanic groups Pichu Pichu and Chachani. Between the volcanos on one side and low mountains in the distance on the other, it definitely feels like a mountain location. The “White City” dates back to the middle of the 16th century and still has several buildings from that era. Filled with centuries-old white-stone churches and homes, it is a mecca for amateur history buffs. The Plaza de Armas, with its massive cathedral and arch-lined walkways, is one of the most beautiful plazas in South America. But its crowning glory is its food. Few cities can rival the cuisine you will find in Arequipa. From the small traditional restaurants called picanterias, to the high-end establishments, the quality, variety, and taste of the dishes offered is to die for. A typical menu del dia is less than $5 but even at the more expensive locations, you rarely spend more than $40 for a couple. 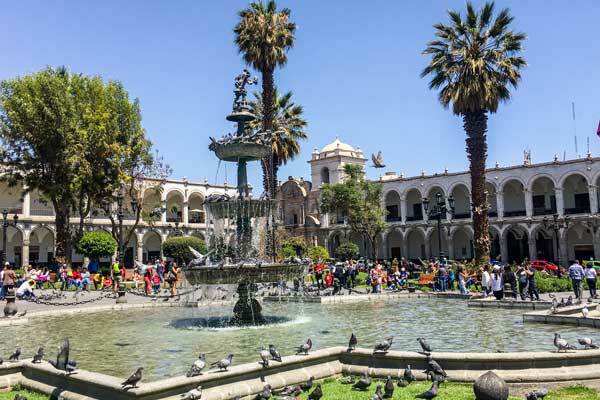 When my wife Nancy and I lived in Arequipa, we rented our large, furnished, and beautifully decorated three-bedroom condo for $700 per month. But we could have found an unfurnished unit for half that price. Expats tend to live in the more popular neighborhoods of Yanahuara and Cayma, which are both a short walk from the central Plaza de Armas. During the summer months, locals head to the small Pacific Coast beach towns of Mollendo, Catarindo, and Meija that are only a couple of hours away by car. Nearby Colca Canyon, more than twice as deep as the Grand Canyon, provides ample opportunities for weekend getaways.